Advance Africa volunteer 2019 projects in Kenya are available for international volunteers in orphanages, schools, hospitals and community medical clinics. We work directly with the projects where we send you and where your contribution will make a real and meaningful difference. You will be offered a personal and customized placement service. You will be supported throughout the duration of your placement. We use our local knowledge and spend time in the country meeting your requirements. Customised placements that volunteers have asked for in the past include volunteering in mobile clinics, volunteer in mental health clinics, amongst the handicapped, hospice volunteering, HIV/Aids or doing volunteer work in specific areas like nutrition, dental services and working amongst the Masai, Pokot and Samburu. Volunteer orphanages in Kenya: You will work with HIV/AIDS orphans, many of whom are HIV positive. Others have been abandoned after birth. We have orphanage projects in Nairobi, orphanages in Mombasa, Nakuru and other small towns. Orphans in Kenya orphanages and Children’s homes are extremely disadvantaged and encounter a lot of hardships in their life. They are deprived of many opportunities necessary for their development. The children in our Kenya orphanage projects have never experienced loving, caring and stable relationships. As an orphanage volunteer, you will help vulnerable children. The children will receive much needed attention, compassion, hope, encouragement, support and love from you. Through the education and compassion they receive from you, the children are empowered to challenge life, poverty and exploitation. Kenya volunteer orphanage placements or voluntary work with disadvantaged children is very fulfilling. Volunteering in orphanages in Kenya will be one of the most challenging positive, life-changing, and rewarding experiences of your life. Volunteers in this area are given responsibilities depending on their medical qualifications. Qualified doctors and nurses can carry full day to day treatment of various diseases. Medical students work under the supervision of qualified medical personnel. Volunteers who do not have medical training help in packing of drugs, painting etc. The volunteers can work in the areas of maternal health, mental health, surgery, laboratories, counseling and testing. Volunteers can work in clinics located in the slums of Nairobi, or in hospitals located elsewhere. The HIV/Aids epidemic in Africa is unusual in its scope and magnitude. Health workers in Kenya are laboring to cope with an unprecedented surge in the number of HIV/Aids patients. As a HIV/Aids volunteer, you will help us mount an effective response in meeting the needs of our target communities. Your HIV/Aids volunteer service will include homecare visits to the slums bringing vital supplies of food, medicine, and providing basic medical care. HIV/Aids volunteers help decrease the spread of HIV by raising awareness and promoting access to medical care. Volunteers also provide emotional support and foster compassion for people living with HIV/Aids in the community. Volunteers educate and counsel the community, schools and individuals. AIDS orphans are often neglected in Africa. As a volunteer in this program, you will visit HIV/Aids clinics, and help meet the needs of AIDS orphans. Volunteer opportunities are available amongst the Masai tribe of Kenya. Volunteer work available includes teaching at both primary and secondary schools located in Masai villages. All children at the schools come from the Maasai tribe. Click here for more details on the Maasai Volunteer Program. Volunteers on the teaching program in Kenya assist with the teaching of different subjects in Kenyan elementary and high schools. Volunteer teachers can teach mathematics, science, geography, social sciences, history, business education, English, art and music. Volunteer teachers are not required to have teaching experience. Our volunteers work in schools with students who come from very difficult economic circumstances or are orphans. Please note that Kenyan school holidays are in April, August and November 15 – January 3rd. No school teaching will be available during that period. Kenya volunteer jobs are available in the cities of Nairobi, Mombasa, and Kisumu. We also have volunteer work in Nyeri, Nanyuki, Matunda, Migori and Kakamega. More volunteer destinations are available with special arrangements. You can also go scuba-diving and surfing if at the coast, skate on the ice-skating facility at the Panari Hotel, or simply take a day out to giraffe centre and ostrich farm in Nairobi. The volunteer in Kenya program fee covers communication, airport pick up, local support, in-country orientation, training, supervision, accommodation and two meals per day (three meals over the weekends if you are at the provided accommodation). The volunteer in Kenya costs you need to meet are: your flight to and from the country, visa fees, work permits, vaccinations, travel insurance, in-country transport and return trip to the airport. 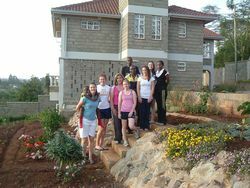 Typical Living Arrangements: Advance Africa Volunteers' house and home-stays.